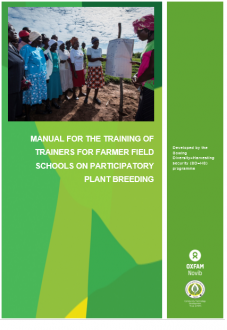 Manual for the training of trainers for Farmer Field Schools on participatory plant breeding. Under revision. This manual provides instructions and background for the SD=HS Training of Trainers (ToT) courses. In these courses (which mostly take up around three weeks), trainers are prepared to facilitate a season of Farmer Field School activities on Participatory Plant Breeding. Topics include the organisation of a Farmer Field School, the setting of breeding objectives, basic background in plant breeding, instructions to design the FFS site and plots, description of weekly activities and a special topic on disaster risk reduction. The key crops discussed are pearl millet, sorghum and groundnut, although most of the manual is relevant when working on other crops as well. This manual is developed by SD=HS consortium partners Community Technology Development Trust (CTDT), Asociación ANDES, Southeast Asia Regional Initiatives for community empowerment (SEARICE) and Oxfam Novib. It is based on Farmer Field School training experience in Zimbabwe, Peru, Myanmar, Lao P.D.R. and Vietnam. This manual is still under revision and we welcome your evaluation, suggestions and questions. Please send those to sdhsprogram@oxfamnovib.nl.